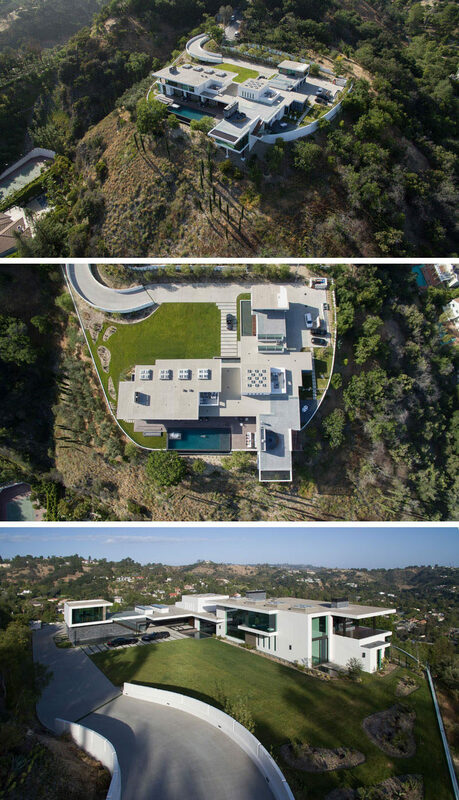 Whipple Russell Architects have designed a modern house in Beverly Hills, California, that has views of the surrounding area. A spiral driveway leads to the house, that required a 10-foot high retaining wall to create a sturdy level pad for building on the empty lot. 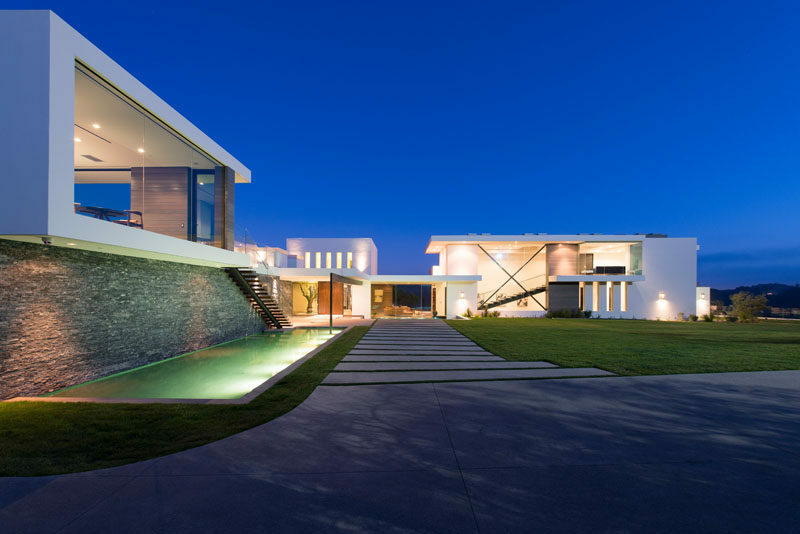 Upon arrive to the house, on the left is a set of stairs that are positioned over a reflecting pool and lead to a photography studio and a gallery space, suitable for hanging the home owner’s large art projects. Wide horizontal pavers guide guests to the front door of the house, that’s reached by steps surrounded by water. 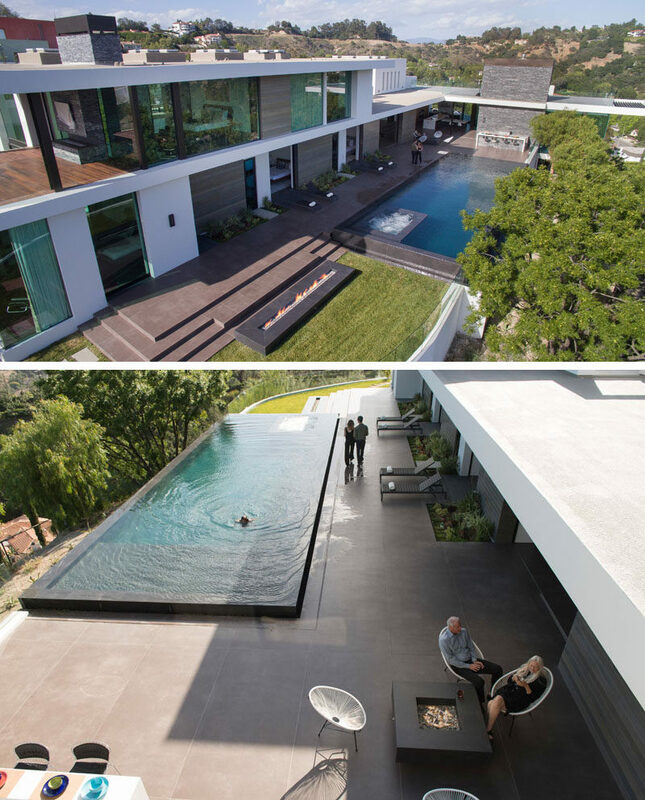 Beside the water feature is a chiseled marble ledger stone wall. 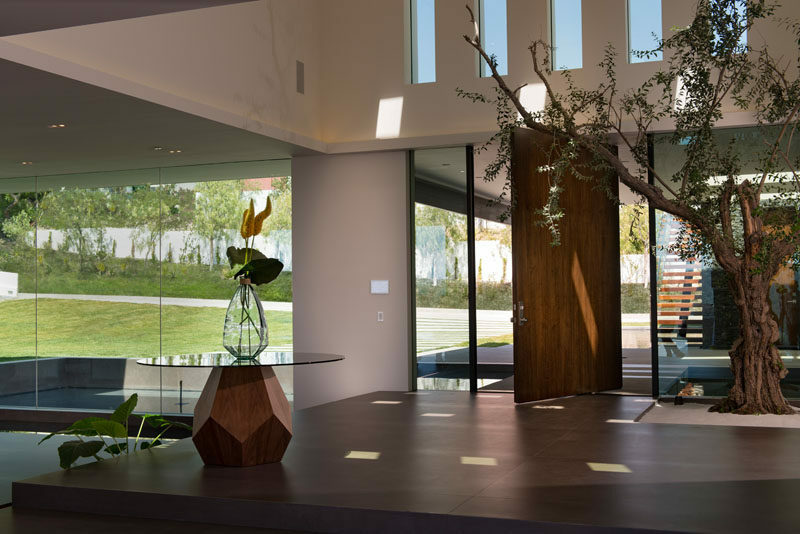 An olive tree lives in the foyer, with the help of grow lights, and off the the side, is a formal dining room. Large earth toned porcelain tiles flow smoothly down three steps and into the living area that’s lined with a series of wall-sized glass pocket doors. In the kitchen, Dekton Quartz has been used for the counters and island, while the cabinets are made from Italian walnut and Wenge wood. The custom kitchen dining table that joins the island is made from Calcutta porcelain, with built-in Yakiniku grills, imported from Japan. The living areas of the home, as well as a few bedrooms, all open up to the deck, the backyard with a fireplace, and a swimming pool. 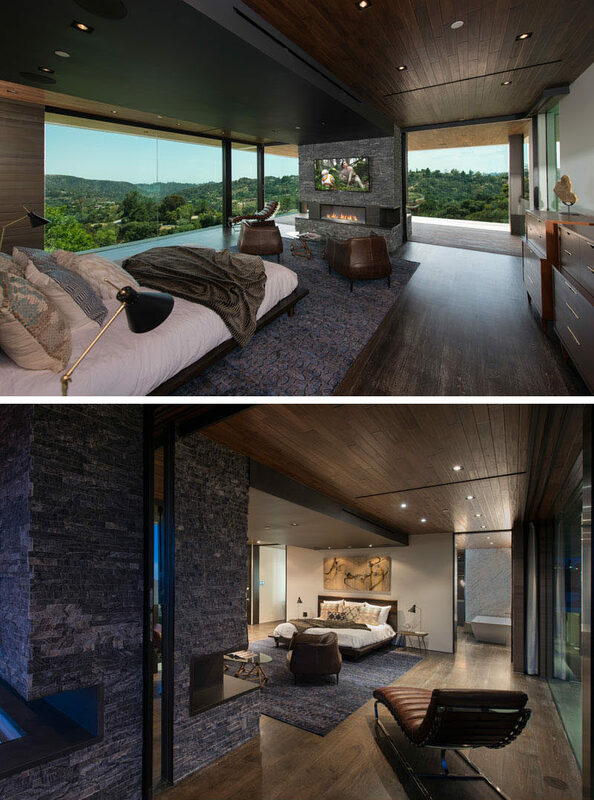 Back inside, there’s another living room with curved couches and a wall of built-in wood shelving. 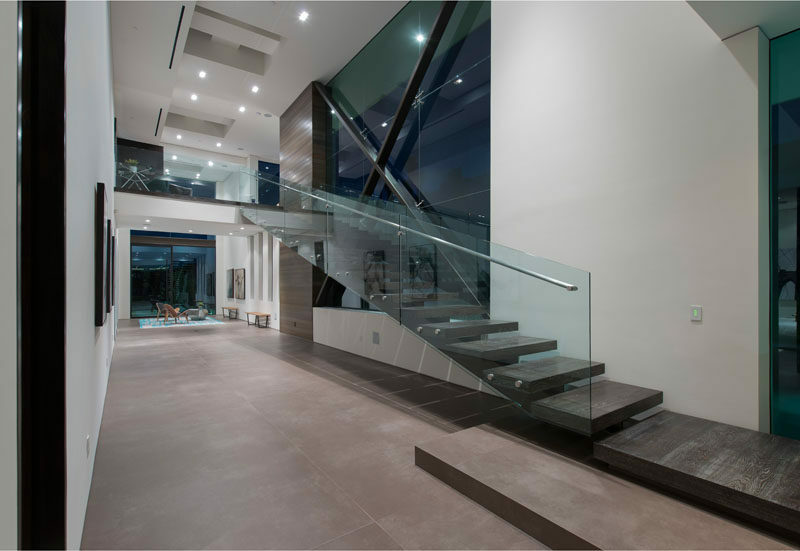 Stairs with a glass and metal handrail follow the wall and lead up to the second floor of the home. Upstairs, there’s the master bedroom suite that has an indoor/outdoor gray, stacked-stone fireplace that also heats the terrace outside. 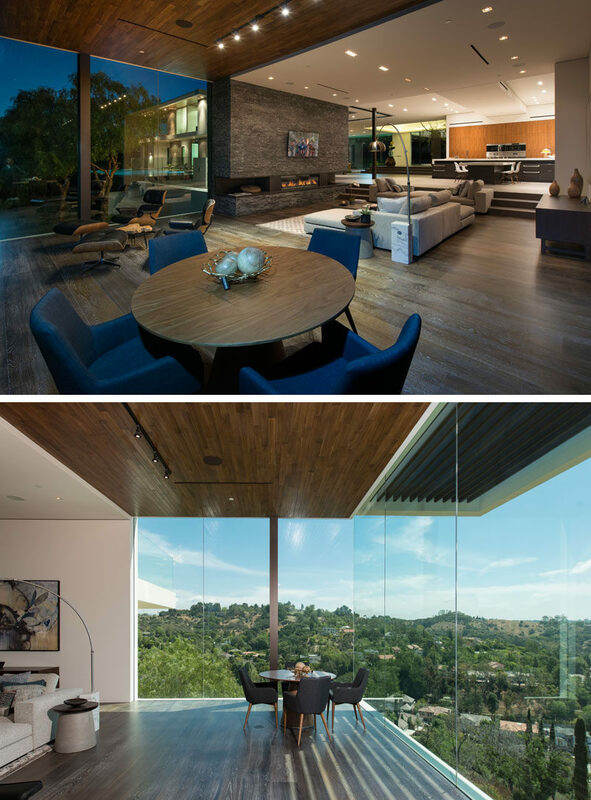 The ceiling features solid walnut planks, while the flooring is custom stained 10-inch oak flooring. 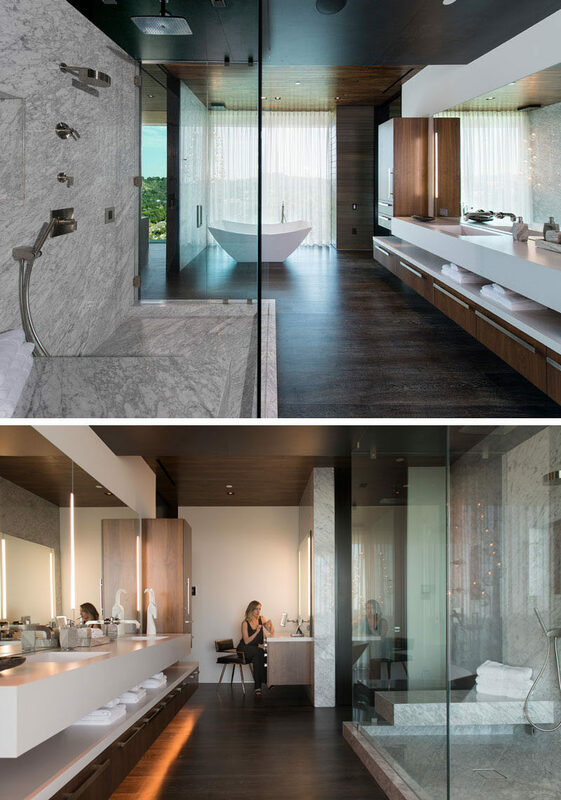 In the master bathroom, there’s a freestanding bath that sits beside the window, as well as a glass enclosed Carrara marble shower and quartz counters.